Babies get to know the “social” world through their interactions with other people. And for this, they use all their senses — seeing, touching, hearing, smelling, tasting, and even movement. By the time babies becomes toddlers, they are able to identify and notice details and differences in the surroundings, and become interested in more meaningful play. Moreover, they also begin to explore their creative side, in their art, music, movement, language, and pretend play. The term “cognitive development” is the process of growth and change in intellectual and mental abilities such as thinking, reasoning and understanding. Infants draw on social ­emotional, language, motor and perceptual experiences and abilities for cognitive development. All of children’s play time with toys, and their indoor and outdoor activities, contribute to cognitive development — and parents play a vital role in supporting their cognitive development. Encourage your baby to develop all the 5 senses —hearing, seeing, tasting, smelling, and touching by pursuing activities both indoors and outdoors. Read to children, show them pictures and allow them to feel different surfaces, such as vinyl floors, carpet, grass, concrete, sand, and mud. Make your child feel safe and secure by hugging and holding them. Communicate with your baby and tell him/her what you are going to do, before you perform any caregiving chore. Avoid the television but play with toys or interact with people together. Let the child discover what belongs to them and what does not. Take your child outdoors to a park, playground or a market. Give your baby toys and materials with a variety of colours, textures, shapes, sizes, and other characteristics. Keep toys and materials within your baby’s reach. Provide playthings that challenge the baby. Talk about what is happening around. Allow infants and toddlers to play for long periods of time and repeat activities over and over. Move toys closer when an infant is reaching for, but cannot touch, a desired object. Play a game of hiding their toys and encouraging children to find them. Praise children for their efforts. Give them enough time to try to solve problems. Provide musical mobiles or toys for infants to watch and listen to. Place pictures and photographs at eye level. Listen and dance to many types of music. Play with safe musical instruments that make all kinds of sounds. North Carolina Department of health and human services. Cognitive Development. Cited 2016 April 20. Available from: http://ncchildcare.dhhs.state.nc.us/pdf_forms/dcd_infant_toddler_cognative_development.pdf. The first year of your baby is very vital as their brain is developing at a rapid speed, which is laying the foundation for learning. The first 3 years are a crucial period for babies to pick up speech and language skills. These skills get to develop very well in an environment where children are being constantly exposed to new sounds and visuals, perhaps in different languages as well! One of the first lessons in communication that a baby learns is that their cry makes food, comfort and companionship available to them (and how they learn to use this ability!). Even very young children learn to identify the sound of their mother or a primary caregiver. The ability of your baby to develop and learn this skill, along with other language and communication skills, is very dependent on the interaction between you and your baby. So, always make opportunities for your baby to interact with you. understands the meaning of "no"
understands simple one-step directions - "sit down"
Sit facing your baby and say their name, before you get into a chatty mood. Talk to your child, ask questions (e.g. “are you hungry?”) or talk about some object that both of you can see. This will help them to learn the meanings of different words. Use actions, sing rhymes, and make noises and funny faces. Be comfortable to be silly (whatever it takes to get that toothless, drooling smirk on their face!) as this can encourage language development. Repeat what you say, and also the sound that your baby makes. Because if you repeat the sound that your baby makes to you, your baby will start copying you and repeat what you say, thus learning new words. If your baby gets the word wrong, say the word again. Communicate in short, simple sentences. For instance, “it is food time”. Give your child opportunities to talk as this will help them learn to talk. Give them enough time to answer your question, as they will take time to answer you. U.S. Department Of Health And Human Services. National Institutes of Health. Speech and Language Developmental Milestones. Cited 2016 April 20. Available from: https://www.nidcd.nih.gov/health/speech-and-language. WebMD. Speech and Language Development - Topic Overview. Cited 2016 April 20. Available from: http://www.webmd.com/children/tc/speech-and-language-development-topic-overview#1. Ontario: Ministry of children and youth service. Your baby's speech and language skills from birth to 30 months. Cited 2016 April 20. Available from: http://www.children.gov.on.ca/htdocs/English/topics/earlychildhood/speechlanguage/brochure_speech.aspx. NHS Choices. Helping your child's speech: Help your child learn to speak. Cited 2016 April 20. Available from: http://www.nhs.uk/conditions/pregnancy-and-baby/pages/helping-your-childs-speech.aspx. NCT. How can you encourage a child’s language development? Cited 2016 April 20. Available from: https://www.nct.org.uk/parenting/how-can-parents-encourage-language-development. As your baby is growing and exploring the world around, he/she also begins to get some control over their own body. The involuntary movements slowly turn into voluntary movements —a transition from rapid and fitful, to smoother and more intentional movements. The term “motor development” refers to this transition and includes movements of the eyes and the ability to hold the head. Gross motor skills involve the movement of large limbs or the whole body, for instance holding their head up, sitting, pulling up, rolling over, and walking. Fine motor skills involve the use of the fingers to grasp and operate objects, for instance, reaching, touching, and grasping an object. You can help build up your baby's muscle and motor skills with simple activities. Provide enough space and loose clothing, so arms and legs can move easily. Place your baby on the tummy on the floor, allowing them to kick the legs and wave the arms. Play mild exercise games by gently moving your baby’s arm and leg. Grasp the hands of your baby, while he/she is lying on the back and pull gently to a sitting position — remember to do this gently. Encourage your baby to crawl by keeping a favourite toy at a little bit of a distance. Provide steady, firm objects so your baby can stand with their support. 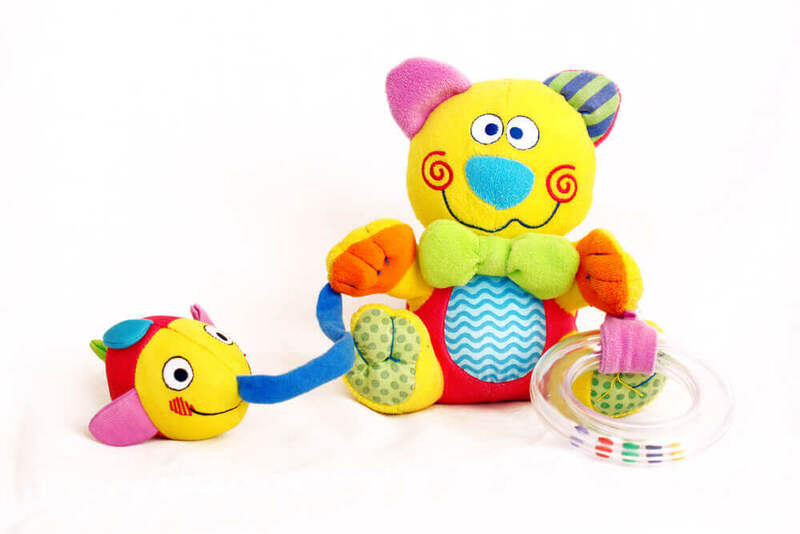 Give your child pull-toys that make some noise as this can encourage your baby to walk to and fro. Encourage your child to walk up and down the stairs. Help your child to jump over a small object or height, for e.g., a book, or first/ second step. Give them a sandbox with simple tools like a stick or old spoon for digging, and containers for filling or packing the sand (or enjoy a family day at a clean beach!). Give them large and small balls for throwing and kicking. BetterHealth channel. Child development (2) - three to six months. Cited 2016 April 19. Available from: https://www.betterhealth.vic.gov.au/health/healthyliving/child-development-2-three-to-six-months. California Department of Education. Perceptual and Motor Development Domain. Cited 2016 April 19. Available from: http://www.cde.ca.gov/sp/cd/re/itf09percmotdev.asp. American Pregnancy Association. First Year Development: Infant Development. Cited 2016 April 19. Available from: http://americanpregnancy.org/first-year-of-life/first-year-development/. Curators of the University of Missouri. Understanding and Encouraging Your Young Child's Large Motor Development. Cited 2016 April 19. Available from: http://extension.missouri.edu/p/GH6113.